Fabulous wealth was said to await those who would obtain these riches. Portugal conquered the province of Goa on the west coast of India. This allowed them to gain the upper hand in the spice trade. It is from this place of operation that the players are looking for opportunities to acquire wealth and fame for their personal business. For this, they will require ships, manufacturing plants and money while ensuring that they keep exploring the region and continue founding colonies. Who will have the most successful business at the end? Goa - The Next Expedition renews the experience with new tiles and a few surprises. This review will not concentrate on the game mechanics themselves, I would rather like to describe the challenges you will face playing Goa. Why? Because this is in my opinion one of the strongest points of this game – the diversity of decisions you will have to make and the resulting diversity of the game itself. However, in order to do that, you need to know some basics first. So, Goa is about managing your spice trading enterprise in India and the Spice Islands. 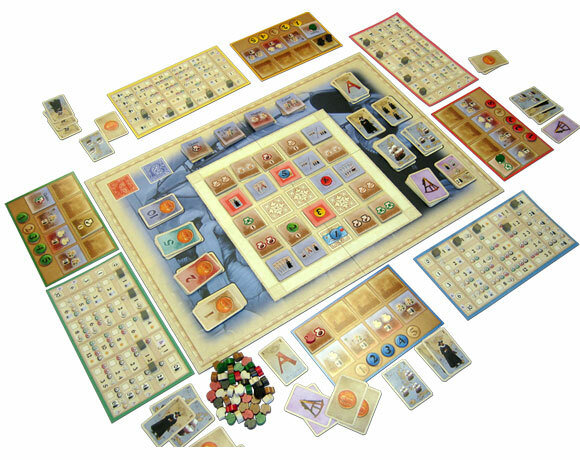 The game is played over 8 turns, with each turn beginning with an auction for tiles. Each player can choose one tile to auction. Each tile you win can either give you resources striaght away (ships, colonists, special cards) or enable you to plant spices and harvest them later. After the auction each player has 3 actions, sometimes more if they have additional action cards. Actions usually allow you to gather resources or upgrade your enterprise (which lets you gather more resources per action most of the time). Upgrading your enterprise is the primary resource sink. The goal of the game is to amass the most victory points, most of which are given for your level of enterprise upgrades. There are also some points for having a certain number of colonies, most cash in the game and so on. This is one of the most important parts of the game. Money lets you win auctions, and without winning auctions you won’t have anything to do or any way to develop. The auction is one round only, so each player has the chance to only bid once. A very devious mechanic is also in place, which says that if you win your own tile (the one you put on auction), you pay the money to the bank. However, if you win someone else’s tile, you pay them the winning amount… What is more, the amount of money each player has is secret, but ALL money movement is open. If you manage to track and remember the money reserves of each player, you can manipulate the auction very effectively. It’s quite easy to do in a 2p game, but try that in 4p… So, what kind of decisions will you face in this aspect of the game? Should I bid high for this tile or hope noone will want it and I can get it cheap? Should I drain this player by raising a bid on a tile they definitely want, even if i don’t need it? Draining a player may mean that they won’t be able to raise the bid on a tile I desperately need later on. Will they follow and let themselves get drained or will they leave me with the tile? Should I bid on this other player’s tile? I need it, but giving him the money is dangerous… And so on, and so on. Choosing the tile to auction is also a nice mini-game in itself. The tiles are laid out in a 5×5 grid. The first player chooses the space the auction will start, and every subsequent player can only choose a neigboring tile. This way you have a degree of control over which tiles your opponents will be able to auction. Of course this ties in with the money management… Should I choose to auction a tile which is useless for me, but will lock my opponent into choosing a tile they don’t need? If I choose a specific tile, what options does that give to my opponents? Are those options not too powerful? There are several types of resources in the game: money, 5 kinds of spices (cloves, pepper, cinnamon, ginger and nutmeg), colonists and ships. Ships and spices are used to upgrade your enterprise, money is used for auctions and colonists are used to… well, found colonies. Colonies let you plant and harvest spices later – and they are better than the normal spice tiles you get from the auction, because colony tiles let you plant verious types of spice on one tile. Each enterprise upgrade needs several ships and a certain combination of spices – so the obvious decision point is to where to spend your spices and ships. Each turn you have 3 actions, possibly more if you have additional action cards (most commonly obtained in tha auction phase). There are several action types you can choose: upgrade your enterprise, build ships (1 to 5 per action depending on your upgrade level), harvest spices (1 to 8 per action), get money (4 to 12 per action), get expedition cards (1 to 3 per action) or found a colony (with 0 to 6 bonus colonists). As you can see, the efficiency of your actions rises dramatically with your enterprise upgrades. So, which actions should you do this turn? In what order? Should you spend your additional actions now or save them for later? You get expedition cards from your “Get Expedition Cards” action. The amount you get and the amount you can hold is determined by your upgrade level. You can then play them to augment an action you do in your Action Phase. One catch though – one action can only be boosted by one expedition card. Expedition cards are very powerful – they can give you resources, let you upgrade without using ships or spices, and do many other things. Their most powerful effect is that they effectively let you save actions, because otherwise you would have to spend those actions to gather resources the expedition card has just provided. You will have around 25-30 actions each game, so each action saved is worth a lot. But of course you have to decide, which expedition cards to use – in the late game you usually have more expedition cards than actions. On top of that, expedition cards have symbols on them, which follow a simple set collection mechanic – the more of the same symbol you hold at the end of the game, the more bonus victory points you get. At a maximum you can get 15 VPs (by having 5 cards with the same symbol), which is around 30-40% of the final score… a lot. So, do you play this great expedition card, or do you save it for the VPs? I love this game. It’s entertaining on so many levels. It forces you to think flexibly and control various aspects. On the other hand it does not get bogged down in AP – usually a game lasts around 90 mins. It has some randomness factor (the expedition cards you draw, the way the tile grid is set up) but that only adds to replayability and does not have the potential to block you. This game was the first I have ever given a 10/10 (changed it to 9/10 later, but still one of the greates games I have played). Played this for the first time yesterday. Initially, somewhat confusing and hard to learn. I did not if I was going well, or making the right moves. So, don’t expect to win you’re first time around. But I think, by the end, I had a much better idea what to do, and not totally mess up my plantation production, etc. I ended up taking 2nd place (by just one point over another beginner player). I know I would do better next time around (oh, yea .. aiming for 1st). Recommendations: Don’t get too swept up in the bidding; but target your bids for resources, etc that you need down the line. I think the resource/spice production was the most important track, although I ended up not getting last colony (perhaps a mistake). In fact, yea, you need all the colonies to take 1st place. So, be sure to load up on your colonist dudes. Okay game — resource allocation, strategic planning, bidding. Add a Review for "Goa"